Large Alaska oil discoveries announced in the last two years are creating a buzz in the oil and gas industry, but it's uncertain when or if they will bring the state the new production it's seeking, a state petroleum geologist told state lawmakers last week. Still, a number of smaller projects already in the works could increase production by more than 100,000 barrels before 2021, though some of those projects are currently postponed amid the oil price slump, according to the presentation to the Senate Finance Committee by Paul Decker of the Alaska Division of Oil and Gas. "There's a lot to be optimistic about," said Decker, the division's resource evaluation manager and a ConocoPhillips employee before joining the state in 2004. Meanwhile, the large Alaska discoveries that have made headlines worldwide aren't expected to start production until at least 2022, if at all. The numbers were presented by Decker to the Senate Finance Committee on Tuesday. They're closely watched by lawmakers and others as the deficit-plagued Alaska state government tries to boost revenues by increasing the crude flowing through the 800-mile trans-Alaska pipeline. Oil taxes and royalties have made up the large bulk of state revenues over the years. 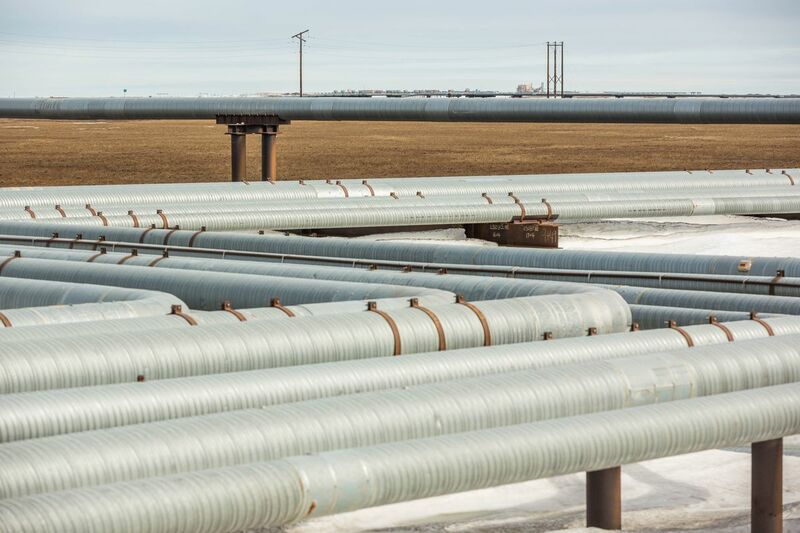 Since mid-2015, oil explorers have announced three large discoveries on the North Slope that together, if peak estimates are correct, could add 420,000 barrels of oil daily to the pipeline, according to company estimates. But the projects are not expected to be developed for at least five years, and perhaps will never be developed, according to Decker. They face the same challenges that have stymied some Slope projects for decades, including big costs, short working seasons and regulatory hurdles. Oil production so far this year is averaging about 560,000 barrels daily, about one-fourth the throughput in the late 1980s. The new discoveries have generated interest in the United States and internationally, said Decker, including at a recent conference in Houston, Texas, hosted by the American Association of Petroleum Geologists. "Our booth was literally humming. There was an audible buzz," Decker said. Referring to the big discoveries, Decker said the division feels "pretty solid" about the production estimates at Pikka, a project involving Armstrong Oil and Gas of Denver and Spanish oil company Repsol. The state has worked closely with the companies and reviewed their well data. Peak production has been estimated at up to 120,000 barrels of oil daily. As for Caelus Energy Alaska's discovery in shallow waters at Smith Bay, the state still has a lot left to learn, Decker said. The company estimated last fall its discovery could produce up to 200,000 barrels daily. But Decker said the project is remote and would need a pipeline more than 100 miles long, adding expense. The rate at which the oil might flow from wells hasn't been tested yet. And the company has said the reservoir quality looks challenging for production, although hydraulic-fracture stimulation, also known as fracking, could help, said Decker. Caelus hoped to conduct further exploration drilling in 2018. Multiple wells will be required to prove up the field, Decker said. In January, ConocoPhillips heralded its Willow discovery in the National Petroleum Reserve-Alaska, saying the field could produce up to 100,000 barrels daily. In addition to those and other long-term prospects, Decker also highlighted about 10 prospects with shorter timelines to production. Those projects could begin producing oil within four years, although some are currently on hold as company profits suffer during the oil-price rout. Two projects that haven't been postponed, with first production estimated between 2018 and 2021, are Greater Mooses Tooth 1 and 2 on federal land. The two ConocoPhillips prospects could yield between 55,000 and 60,000 barrels of crude daily. Hilcorp Alaska's Moose Pad project in the Milne Point unit is expected to add 10,000 barrels daily during that period. Brooks Range Petroleum’s Mustang project, with peak production estimated between 12,000 and 15,000 barrels of oil daily. Caelus’ Nuna project, with peak production estimated at 20,000 to 25,000 barrels daily. ConocoPhillips’ 1H News project, with peak production estimated at 8,000 barrels. Sen. Peter Micciche, R-Soldotna, suggested production by 2021 could be at least 105,000 additional barrels of oil, according to the list. He said even if Slope production remained flat — as oil production at some fields declined and new ones came on line — the state would benefit, he said. Decker cautioned some projects may not be developed. He said the state had hoped some of those would have been in production by now. He said postponed projects could still be completed in a relatively short period of time after they are restarted. Decker said while some of the prospects are on federal land and not subject to Alaska royalties, the state will still benefit. New production will help sustain the life of the TAPS system, which includes the Valdez Marine Terminal. "Any oil is good oil in our opinion," he said. But Alaska's large discoveries have come amid increasing concern that a lack of global oil discoveries will eventually hurt oil supply. New discoveries worldwide reached record lows in 2016, creating concerns about future energy supplies, the International Energy Agency in Paris said on Thursday. The decline has come as producers continue to invest in shale oil in fields such as the Permian Basin in Texas. But oil companies are reducing exploration activity elsewhere, said the agency, which observes global energy trends for 29 member countries, including the U.S.
That could cause oil stocks to eventually tighten. "The key question for the future of the oil market is for how long can a surge in U.S. shale supplies make up for the slow pace of growth elsewhere in the oil sector," said Fatih Birol, IEA executive director.